If you’re looking for a big, bold statement appliance with loads of space and features, then look no further than classic American-style fridge freezers. As long as you have the space for them, they are one of the best additions to any kitchen and are perfect for big busy families and households with sharers. These fridge freezers have become increasingly popular in the UK over the last decade as they offer substantially more space and come with useful additions such as ice makers and chilled water dispensers. The downside of buying one of these fridge freezers is that they cost more to run due to their size, and they require a big kitchen to accommodate them, so make sure you have the budget and room to handle a large fridge before you buy one. Here is our list of the best American fridge freezers on the market right now, as well as a useful buying guide to help you decide if they are the right kind of appliance for you. In our mind, this is the best Smart fridge freezer around. Thanks to a 601L capacity, this is an appliance for those families who get extra large weekly shops and always struggle cramming it in. It is full of innovative features which will ensure your purchase stands the test of time, which is perfect if you always want to be ahead of the curve when it comes to having the latest gadgets. First of all, the InstaView function lets you view what is inside the fridge without you having to open the door. Just knock twice on the Door-in-Door, and the glass goes clear and interior illuminates. This maintains temperature for better efficiency (and also allows you to write the supermarket buying list without faffing about too much). This door can also be opened separately using a little lever, for easy access to the upper part of the fridge without opening the entire full-length door. It may seem like a completely pointless exercise but trust us – if you just want to grab the ketchup quickly, you will soon realise it does indeed make things much easier. The cleverness doesn’t stop here, either. There is a special zone to keep meats and fish fresher for longer, and extras such as a temperature warning light and door open alert. It is super quiet at 39dB, and the energy rating of A++ means it is cheap to run despite its size and tech involved. The water and ice dispensers need to be plumbed in, so ensure this is possible before you buy. There only nit-picking point is that the temperature display only shows the desired point as opposed to the actual temperature. But from our tests, it always seemed to be pretty accurate anyway. Large dimensions - check it will fit! Thanks to a super generous 592L capacity overall, making it one of the largest on the market, this is a fantastic option for those needing all the space possible. 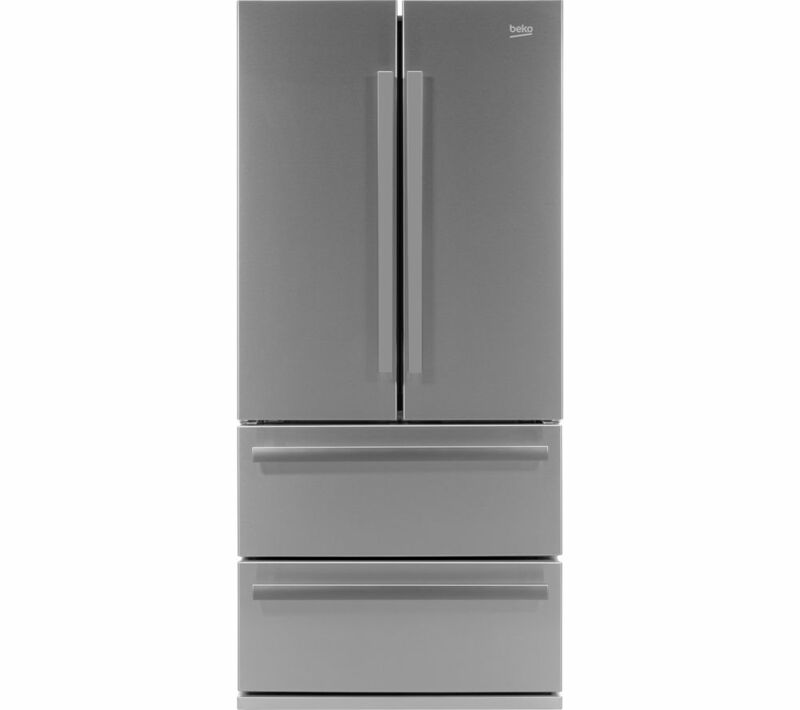 We think it is actually one of the best premium American fridge freezers available currently. NoFrost technology prevents ice build-ups and MultiAirflow tech keeps temperatures consistent. There are even vitaFresh Plus drawers where the temperature and humidity can be fine-tuned to keep meat or veg fresher for longer. A handy BigBox drawer in the freezer will help you at Christmas when the turkey needs to be stored somewhere, or when summer hits and those large tubs of ice cream need to be kept safe. There are also plenty of shelving opportunities in the door, which we are a big fan of. It can be annoying not being able to fit big bottles of fizzy pop, your milk, all your sauces or those little remaining cloves of garlic/dips/cheese anywhere safely. But it is safe to say you’ll have no issues here. There is also a bottle rack, as well as shelving in the freezer side for individual ice lollies or that small bag of peas which would otherwise end up tipped over. It is nice and easy to position thanks to four wheels on the base. You can pop it just where it needs to be and easily wheel it back out when it comes to the big spring clean. It is still very deep though, so just beware and ensure you can fit it through your front door on delivery! Grabbing an American fridge freezer for under £500 is something which would have been unheard of a few years ago, but technology is a wonderful thing now, and this fab option falls perfectly in that bracket. It may be on the cheaper side, but it certainly doesn’t seem it – this is why it is our best budget pick. It is available in silver and black, which will suit any kitchen decor. Inside, there is a very generous capacity over 500L in total, and the doors open as normal too so everything is easily accessible. In terms of those little extras which also make your life easier, the freezer is frost free, and there are an open door alert and internal light. It lacks a temperature warning signal, but for the price, it is a little addition we can live without. A noise level of just 43dB and energy rating of A+ are the icing on the cakes. They make it the perfect solution to your family kitchen, keeping things quiet enough to get on with your socialising and meal times but cost effective to run, too. If you don’t want to spend loads of money but are in desperate need of extra space, then it is a great way to get the best of both worlds. There are two salad drawers and shelves in the door to top it off. Smeg isn’t just a brand all about aesthetics – their appliances are also incredibly helpful in the home. This fridge freezer is no exception, thanks to the huge 540L capacity and features which make your life easier. Manual defrosting is a thing of the past thanks to No Frost technology, and the handy Multi-Zone compartment is brilliant for adding extra space. You can choose whether it acts like a fridge or freezer, so whether you need more space for the BBQ meats or for the frozen vegetables and ice cream, you won’t be stuck. The Active Fresh Blue Light keeps fresh fruit and vegetables in prime condition for longer, so you won’t have to throw it all together for a mismatched mean to ensure it doesn’t end up in the bin. You can press the ECO button to set the best temperatures for maximum efficiency, which are -17 and 6. The temperature can also be controlled manually in case you’re storing any particularly needy foods. There are no wheels to make it easier to fit, but it is a standard 90cm width so it should fit into most dedicated spaces. We love the large handles, and the multi-door design, so you only open the section you need as opposed to the entire compartment, to limit the amount of cold air escaping. It stands out from the rest in the looks department, being white. There are a couple of other white fridge freezers out there of course, but if you’re someone who thinks they always look a bit uninspiring and basic then this is an appliance which will definitely make you think otherwise. In addition, the price is competitive. It does miss a few things which may put you off, such as a water/ice dispenser or antibacterial protection. But overall, it is one for the design conscious we think. A handy fridge freezer for any kitchen, with nice medium capacity for anyone who needs everything within one appliance to save space but doesn’t require a gigantic 500+L capacity. It will hold around 23 bags of groceries. The clever No Frost freezer means you won’t have to bring everything out every few months to scrape away at chunks of ice, so you’ll always have maximum capacity available. This is possible as it always keeps air circulating around each shelf, which also helps to keep everything at the perfect temperature; vital in the summer months when it is stocked with ice cream every couple of days. If you just want to place your new water dispensing appliance in your kitchen without messing about with plumbing, then this is the perfect solution. Just pop it in place without the need to call the plumber first. There is an A+ energy rating, and it has a 15-hour power failure safe storage ability. You’ll have plenty of time to make the necessary amendments if your electricity goes off. The interior LED is nice and bright, too. It is a little difficult to fit bottles in the fridge door, and larger items don’t fit comfortably in the freezer drawers. But apart from this, the price is great, and it is the perfect easy solution for families. The Samsung Family Hub is a product which will revolutionise the way you engage with your food storage. Smart home appliances are rapidly on the rise, and if you have already got your home kitted out with the latest technology, then grabbing a smart fridge freezer will help you stay connected. Internal cameras are a pretty futuristic feature that allows you to see inside without opening the door. Even when you’re not at home, just check the app for easy food management on the go. You can create a shopping list, then nip to the shops and use the camera to make sure you haven’t forgotten any vital meal ingredients. You can even watch TV as you cook or listen to the radio through the appliance, thanks to the 21.5 inch control screen. Bluetooth and Wi-Fi connectivity lets you connect it to any smart multi-room speakers too. Great if you like to make meal preparation a fully entertaining event. A unique feature is the CoolSelect+ Zone at the lower right, which lets you choose between additional fridge/freezer space. It’s always great to have this kind of flexibility in the family home. The Samsung RF56M9540SR is one of the best smart American fridge freezers on the market, and will keep you ahead of the game. Missing your favourite TV or radio programme because you're cooking is a thing of the past as this product boasts all of the entertainment features you need and more. However, the water dispenser does require plumbing which may prove difficult for some customers. If internal storage space is really an issue and you don’t want to have to start buying extra chest freezers and cutting down on the weekly shop, then an American fridge freezer could be the answer. The perfect one could give you around 3x the storage space of an ordinary fridge freezer, and over 100L extra compared to having two separate appliances. The fridge is on the right and freezer on the left, so both are easily accessed. In the fridge section, there is a bottle rack, five door storage compartments, two salad crisper drawers and four shelves, so you can accommodate everything in the best way to suit you. The ice and water compartments do need plumbing in, but this is worth it for the luxury of cool drinks on hot days. The stainless steel outer will fit into any kitchen decor, and holiday mode will keep everything in working order when you’re not there to check it yourself. If you find it best to do your food shopping in bulk and tend to freeze leftovers en masse, then a huge product like this 600 litre model from Beko will have ample storage space for all of your chilled and frozen groceries. A stainless steel design with side-by-side doors and two huge freezer-drawers, this would be the perfect option for a large family or a household of sharers. Plus, there is a fingerprint-proof coating to keep it clean. We think this product offers excellent value for money for what you get. While most are a pain to move around, this Beko model comes with wheels that make it easy to manoeuvre when setting up. Benefits of this Beko offering include antibacterial door seals, integrated odour filter and blue internal LED lights that actually help to maintain the vitamin content in your fresh fruit and vegetables. With an A+ energy rating, it’s also an efficient and environmentally friendly option for the home. A nice feature is the internal LED display, which allows you to manually set your temperatures with ease. While it would be nice to see an integrated ice and chilled water dispenser, what it lacks in fancy add-ons, it makes up for with a spacious interior and useful shelving for eggs and bottles. The perfect family-sized product: reasonably priced with all the right hygiene and energy efficiency features. The RF540ADUX4 Goliath from Fisher & Paykel hs been given that name for a reason. It is a beast of a three-door fridge-freezer, and for those of you out there who never seem to have enough space. The huge double doors and bottom pull-out freezer with fully extendable drawers makes access easier than ever, too. The exterior is stainless steel so it looks modern, but is coated with a special EZKleen film to avoid unsightly fingerprints. Just give it a wipe and polish every week and it will look good as new. Built for elegance and convenience, it comes with an ever-popular built-in water and ice dispenser. The glass shelves are height-adjustable to accommodate larger items and despite being very long, are easy to remove if you need to give them a wipe. The downside to a model of this size and calibre is that it does use a lot of energy and will cost approximately double to run compared to appliances half the size. Which does technically make sense. It is still rated A+ though. If space is essential, then the price is worth paying in our mind. A powerful, spacious, ‘all singing, all dancing’ product with ice maker. This best top-end appliance is a great investment for any modern kitchen. One of the benefits of American fridge freezers is the ability to have fresh water and ice to hand, and it couldn’t be easier to use this fridge thanks to the LED electronic controls. The benefits don’t stop there with this Kenwood model. Super freeze and cool functions bring your new food shop down to temperature a lot quicker than ordinary appliances, which saves you energy as well as keeping the rest of your food in prime condition. Frost-free technology further means that you will never have to get rid of ice build up as it does all the hard work for you. A multi-cooling system features eight air ducts which cool circulate air more efficiently than in ordinary fridges. This keeps your food fresher for longer, as the fans adjust cooling on demand. You’d be forgiven for thinking all of this extra cooling power must mean it is a noisy appliance, but you are wrong. The compressor means you’ll barely hear it when it is in operation, which is handy as it has to be left on all the time. Furthermore, it is rated A+ for energy, so won’t only save you a lot of wasted food but also will cut down your energy bills. There is a holiday mode, so it can change how it operates even when emptier than usual. A stylish and convenient buy with all the newest features, for any modern family home. Due to the fact that these fridge freezers are so much bigger and bulkier than standard fridge models available in the UK, here are some pointers to consider before investing in one. The average American-model fridge-freezer is approximately 1.8 metres tall, 0.9 metres wide and 0.8 metres deep. That’s a big old appliance to try and fit into a small kitchen, so unless you’re confident you have plenty of space, then you might be more comfortable with a standard-sized fridge. Before you go ahead and order, make sure you’ve carefully measured the available space, allowing a little room above and behind the appliance for air to circulate. Another thing to consider is how you will physically manoeuvre it into your home – if you live in a block of flats for example, will you be able to get it into the lift or up the stairs? Do You Have A Plumbing Point? Most fridge freezers of this style need to be plumbed in order for their chilled water dispensers and ice-makers to work. Make sure you have a plumbing point available, perhaps close to a washing machine or dishwasher. Are You Prepared For The Costs? Because these appliances are larger, they tend to be more expensive to purchase than standard models. Average prices range from between around £600 for a cheaper model and exceeding £2,000 for a more expensive model. Essentially you are paying for the increased size, as well as features such as digital displays and dispensers. They are also more expensive to run, as more energy is required to keep everything chilled in such a big appliance – so you should expect higher electricity bills as a result of choosing an American-model fridge freezer over a standard one.